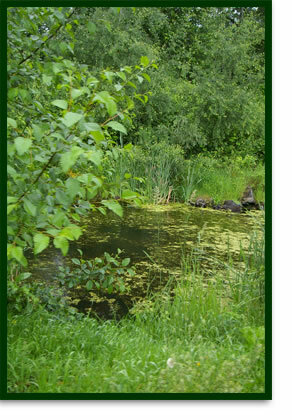 In 2001, Galey Farms partnered with the District of Saanich and the Swan Lake/Christmas Hill Nature Sanctuary to restore a 600 metre section of the Upper Blenkinsop Creek, adjacent to Lochside Regional Trail. With the design services of Aqua-Tex Scientific Consulting Ltd., the project won the 2002 FCM-CH2M Hill Environmental Award - the top ecological award in Canada! With the projects' huge success and benefits, Galey Farms has since joined Conservation Partners Program, an initiative of The Land Conservancy which aims to forge a mutually beneficial partnership between Conservation and Agriculture in BC. 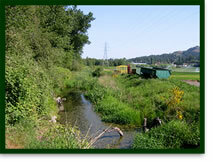 Reinstating the natural habitat of the creek was a win-win situation. As the area transformed back to its natural state, native wildlife and insects returned in abundance to the west side of the farm. This has in turn been a huge boon to Galey Farms Integrated Pest Management Program, resulting in greatly reduced pesticide use as bird and insect populations increase.